Millionaire currency trader Greg Secker is driven by the passion to make wealth and ﬁnancial security accessible. With trading ﬂoors around the world, Greg has taught over 200,000 people how to become ﬁnancially free. Greg takes the fear out of ﬁnances with his simple strategies that produce proﬁts quickly and consistently. 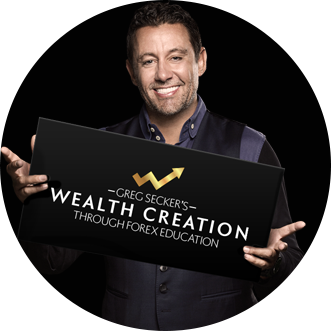 At Greg Secker’s Wealth Creation through Forex Education Workshop, Greg will show you how in just 30 minutes a day you can make a second income. Greg believes that – with the right tools and strategies – anyone from any background can learn to trade Forex. Having worked in the IT industry for over 20 years in various ‘9 to 5’ jobs I thought there must be a better and easier way to secure my financial future – that’s when I found Trading. I attended a LTT Forex seminar and realised this was the way to earn a second income and improve my quality of life. I enrolled on one of the LTT courses where the coaches demystified what I (and most people) think about Trading – too hard, complicated & risky…the opposite is true. While working my IT ‘day job’ I reached a level that enabled me to Trade full time after 6 months and found myself a new passion. I made 7.5% profit in December, and my best winning trade to date is EURUSD with a 2% return. I’m currently residing in Dubai and work as an Operations Accountant in Hellmann Worldwide Logistics. I’ve always been fascinated with the financial world and dreamt of making it big. My interest in Forex grew after attending Learn to Trade’s Forex Introductory seminars and Greg Secker’s videos on the learning aspects of Forex. My experience with LTT has been marvellous. Everyone has been supportive – they are just a click away and always respond to my needs at the earliest. I have been able to acquire a lot of knowledge and expertise based on the presenters and I can foresee myself doing better and getting better with each trade placed. The GFC brought my property development business to a standstill; I needed income and I needed it regularly. Enter Forex. I came to LTT with a vision of creating a monthly income stream that I could achieve on a part-time basis. After attending the Learn Forex course at LTT I knew I was in the right place to learn Forex trading. The trading software made it easy to choose my trades, the learning environment and support from expert traders is second to none. That’s what inspired me to write my book “Foreign Exchange Trading: My First Six Months”. LTT inspired me to become a successful trader!